Although rather less common than Leylandii and slightly slower growing, Thuja is a great choice for an evergreen conifer hedge as it regenerates from old wood if cut back hard. Thuja hedging plants (also known as Western Red Cedar and Arbor vitae) are a versatile group of hedging conifers, they grow quickly but are far more manageable than Leylandii, and (unlike Leylandii) they will regrow if hard pruned back into the old wood. These are one of the easier conifers to identify, just look closely at the glossy evergreen foliage and you will see it arranged in flattened sprays, almost like miniature fans – rub the leaves and they give off a distinctive pleasant scent (some say pineapple, some say pear drops). Thuja are easy to grow, they tolerate any soil from thin and chalky, right through to heavy clay provided it doesn’t sit completely waterlogged. These are first class plants for hedging and screening, even in some shade. 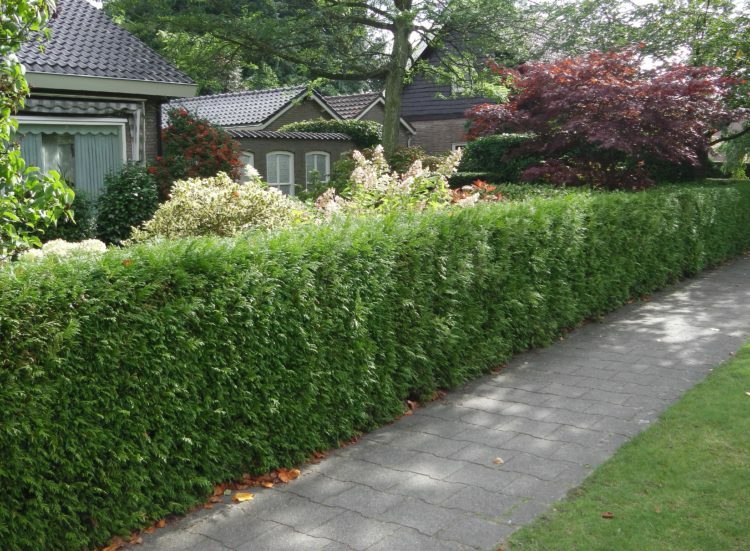 Keep your Thuja hedge looking tidy with a single annual trim in autumn (twice a year for really sharp lines). 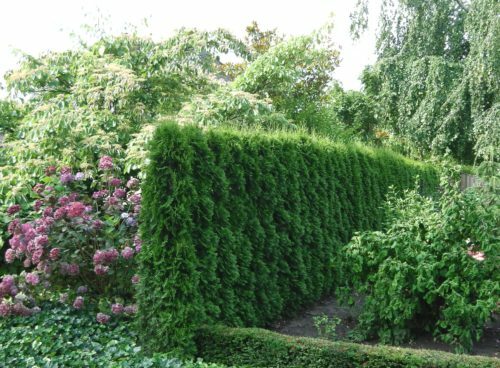 Thuja hedging plants are suitable for a wide range of hedge sizes, from lower screens of 120-150cm right up to several metres or more. The most popular variety is Thuja plicata ‘Atrovirens’, a very similar and useful substitute for the Green Leylandii hedging conifer. It is easier to manage but still grows at 40-60cm each year making a splendid hedge or screen. Thuja Occidentalis ‘Brabant’ is very similar if a little less common, it has dense growth of a slightly lighter and brighter yellow-green foliage and is particularly tough. Thuja occidentalis ‘Smaragd’ is a delightful alternative, the rich green growth is more stiffly upright and architectural, younger hedges almost look like a neat row of soldiers while older hedges are one of the easiest conifers to maintain as this one is more compact. Our Thuja hedging plants are available in a very wide selection of sizes to suit all requirements and budgets. Pot grown plants are available for planting all year, as there is no root disturbance they will always establish quickly. We have small starter plants in 9cm pots right through to bushy XL hedging plants of 2 metres or more. Root Ball Thuja hedging plants are available from October until late April while they are dormant. These are grown in our own fields here on the nursery for several years with lots of space to make really bushy, top quality hedging plants – perfect for when a good degree of instant effect is needed. If you really need fast coverage right now, take a look at our instant Thuja hedges, available in a range of sizes up to 200cm. They can offer privacy and an instant landscape effect from the moment they are planted. If you have any questions about Thuja hedging, or any other plants in our range then please do call our hedging experts on 01580 765600.